Did you read the Nancy Drew stories when you were growing up? B. Kim Barnes, author of Exercising Influence: Making Things Happen at Work, at Home, and in Your Community, 3rd Edition (John Wiley & Sons, 2015) and co-author, with Beverly Scott, of Consulting on the Inside: A Practical Guide for Internal Consultants (ASTD Press, 2011) has written a detective story for and about you. 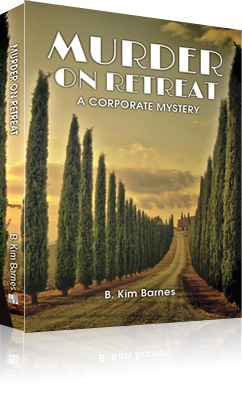 When Sarah Hawthorne became a corporate organizational consultant, she didn’t expect to solve murder mysteries while plotting corporate strategy. But when a charismatic business guru named Scorpio is murdered during an executive retreat at a posh Napa Valley winery, Sarah puts her deductive powers to use outside the boardroom. She’ll need all her considerable brainpower to determine who killed Scorpio: His competing business cronies? A disgruntled CEO? One of Sarah’s fellow consultants? B. Kim Barnes is the CEO of Barnes & Conti Associates, Inc., of Berkeley, California, an independent learning and organization development firm. She has had over 30 years of experience as both an internal and external consultant in the fields of management, leadership, and organization development in a broad range of industries. Kim is a frequent speaker at professional conferences and has published numerous articles in professional journals and books in the U.S. and abroad. She is the primary author of many popular leadership development programs including, among others, Exercising Influence, Constructive Negotiation, Inspirational Leadership, Intelligent Risk-Taking, Creating a Culture for Innovation, Constructive Debate, Consulting on the Inside, and Leading Global and Virtual Teams, all copyrighted programs of Barnes & Conti. She co-developed the program Managing Innovation, Driving Ideas from Strategic Initiative to Value Creation with Dr. David Francis of the University of Brighton’s Centre for Research in Innovation Management.